Senate Education Committee Chair Patricia Rucker, R-Jefferson, left, speaks with Finance Committee counsel Jeff Johnson, center, and analyst Chris DeWitte during a recess Wednesday at the Senate dissolved into a Committee of the Whole to discuss a comprehensive education bill. 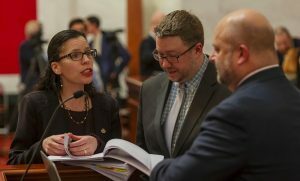 CHARLESTON, W.Va. — A rarely seen mega-committee comprised of the entire state Senate pored over 133 pages, line by line, of a bill that would overhaul West Virginia’s education system. For the fourth time in state history, the Senate dissolved into a “Committee of the Whole” on Wednesday to consider an omnibus education bill (Senate Bill 451) that would enable charter schools, education savings accounts, and a flurry of other changes in the state. After its passing vote in the Senate Education Committee last week, the bill was originally slated for review by the Senate Finance Committee. After all Democrats and two Republicans on the Finance Committee came out against the package, enough for a down vote, Senate leadership waived the committee’s review and put it to the Committee on the Whole.